It’s not often that Cyprus is in the news, and if it is it’s usually not good news; now for instance. 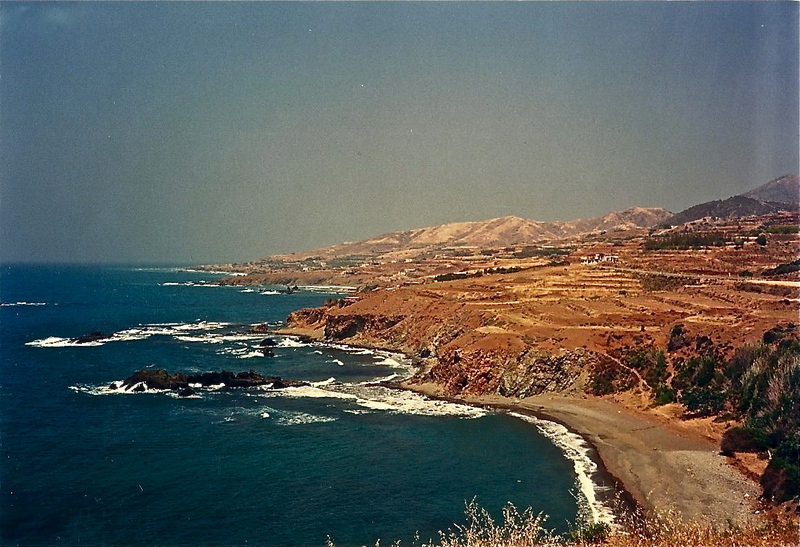 I had a chance to visit Cyprus some 26 years ago(!) and enjoy the beauty of an unspoiled Mediterranean island nation. I brought a day-pack, a sleeping bag, and a point and shoot camera with one roll of film. The particular look of some of these photos isn’t some retro Instagram filter, it’s the scratches and light leaks of real vintage photography. May 1987. While wrapping up a year of school in Jerusalem, I found myself in possession of one last holiday weekend with no particular place to go. There were only two ways out of Israel at the time that didn’t involve an airplane. One was the overland bus to Egypt and the other was the overnight ferry to Cyprus. I had just been to Egypt on the previous break, so I looked into the latter option and found out that $63 got you round trip deck passage from Haifa to Limassol, Cyprus on the overnight ferry. So I bought the ticket and took the ride. Growing up in Los Angeles, I had never really been on a ship or an island before besides Boy Scout camp in Catalina and school whale-watching field trips out of San Pedro Harbor. I didn’t know what to expect from deck passage on a ferry in particular or from the island nation of Cyprus in general. Other than a couple of excursions to Baja California, I had never been to any other countries besides Israel and Egypt. The ferry ride turned out to be great. You just roll out your sleeping bag on the deck with the handful of other budget travelers, enjoy a night in the sea air under the stars, and when dawn comes, you are pulling into port. It’s hard to believe people pay extra to sleep in a berth. 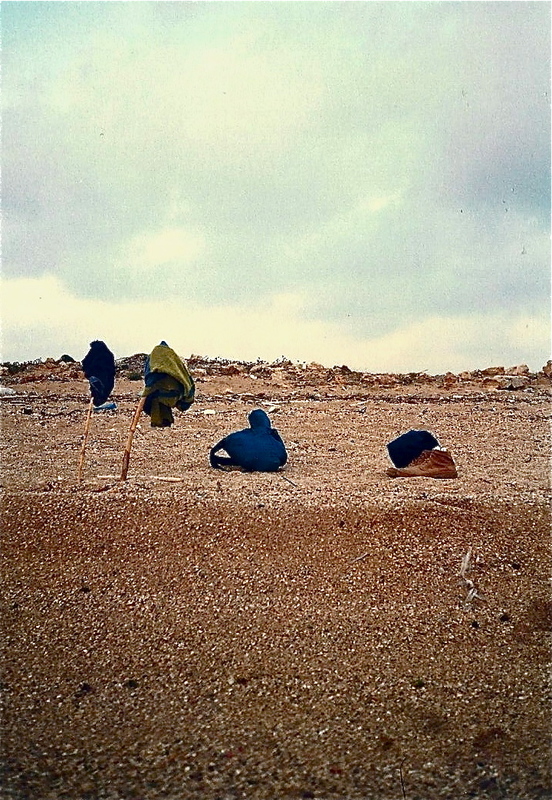 Whatever scams, shams, and flim-flams awaited visitors to the name brand Greek Islands were not in evidence in the Cyprus of 1987. I walked from the ferry landing to a taxi stand and, sans haggling, settled in for the hour-and-a-half ride to Paphos, a town I had heard good things about. Once there, I easily got a room in an immaculate pensione and spent the afternoon exploring the area on foot. 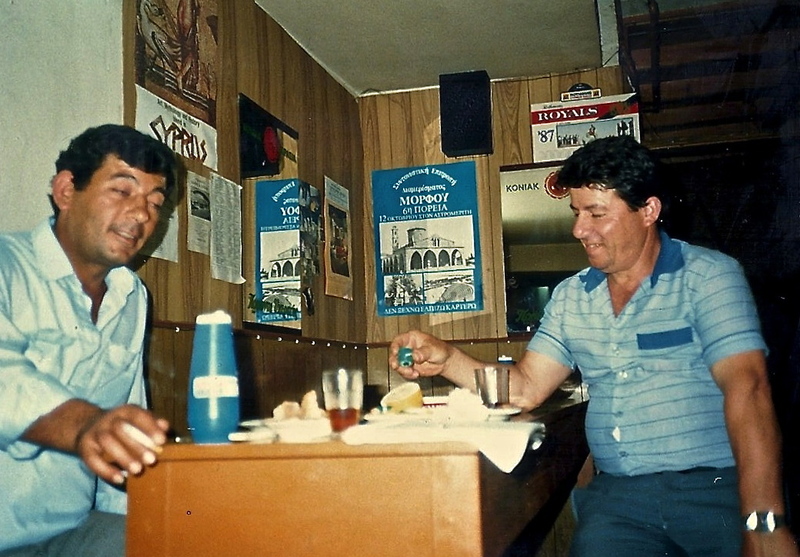 In the evening I walked over to the nearest taverna, ordered a Cypriot brandy, and before I could get two swigs in, was invited to share the table of two jocular locals named Nikos and Adamos. The three of us ended up closing down the place, which in this rural tavern happens before 11:00pm. Adamos and a clean-cut me. Note–the cool Cypriot thing to do is look away from the camera at the last moment, but I never caught on. With that, I was off. Somewhere along the line they must have showed me how to start it, but the rest I figured out for myself. Growing up in L.A., the only motor vehicle I had ever operated was the family Nova. Besides that car, I had never been on anything more powerful than a Schwinn 10-speed bicycle before. 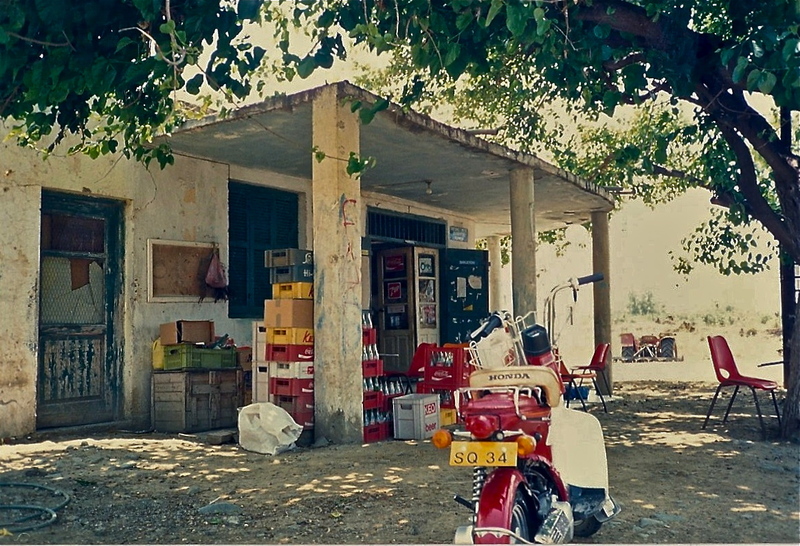 About 10km outside Paphos, the last store I would see for the rest of the coastal journey. Armed with a map of the island so basic it looked like a pirate’s map on the back of a Captain Crunch cereal box, I quickly found the coastal road and never looked back. I was amazed at how small Cyprus felt. I was able to quite easily track my progress along the coast using the contours of the island on the map. I realized that at the rate I was going, I would reach the border with plenty of daylight left. Since gaining its independence from British Protectorate status in 1960, Cyprus has been in the international headlines exactly twice. The second time is now, 2013, as the nation reckons with its EU banking crisis. The first time was in 1974, when the Turkish military invaded and occupied the northern third of the island, setting off a mini-refugee crisis that resulted in some 200,000 displaced people, and divided the island into two hostile countries; a status quo that still holds today. 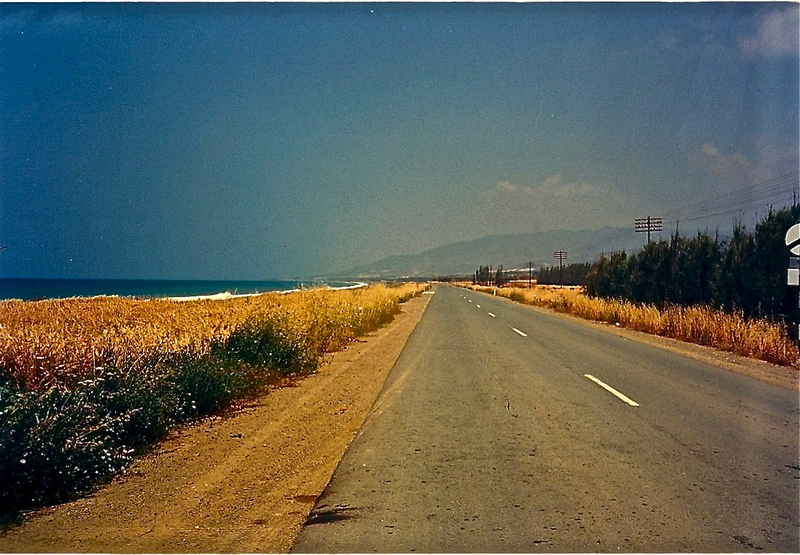 In Cyprus, you drive on the left, but it made no difference, there was no other traffic in sight. 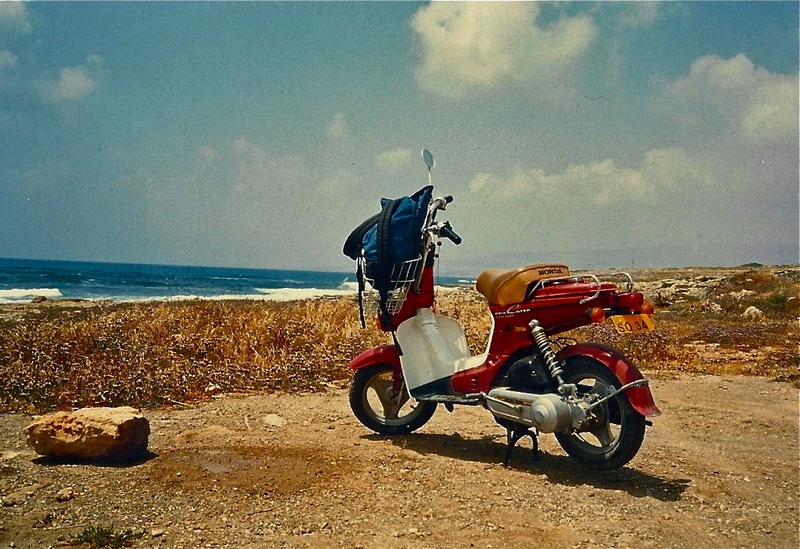 As I work my way up Cyprus’ left coast, I am on an unparalleled traveler’s high. I throttle the moped with the wind in my hair, along a beautiful, pristine coastline, and I’m the only person on the road in either direction. This is as close to perfect as it gets. I’ve got plenty of daylight left. I’m on a mission to reach the border and maybe infiltrate beyond. 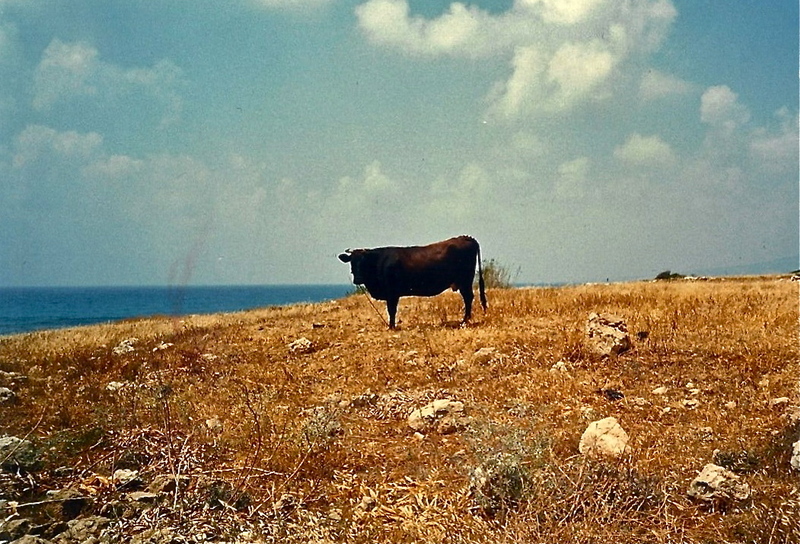 According to the map, Cyprus’ contours look even more exotic in its northern part. I’m sure that if I can get there, I will be rewarded with even more splendid isolation. The only obstacle facing me is the dearth of gas stations to fuel up at when the time comes. Views like this, all day long. At some point, the paved road turns to dirt, but I’m still on a quest to make it as far north as possible. The map indicates that I’ve already blown past two Maginot Lines separating regular Cyprus from Northern Cyprus, beyond which further travel is ostensibly prohibited (according to the cereal box map). Yet I saw nothing. I was beginning to think the whole border thing was a bluff, that they just tried to discourage people from going, but that an intrepid tourist working the dirt roads on a moped could simply shoot right through. Being a novice off-roader, it didn’t occur to me that you had to proceed much more cautiously on dirt roads than paved ones. My front wheel soon found a trough and when I tried to brake, I spilled. The bike got pretty dinged up and I had a raspberry the size of a blood orange on my knee. 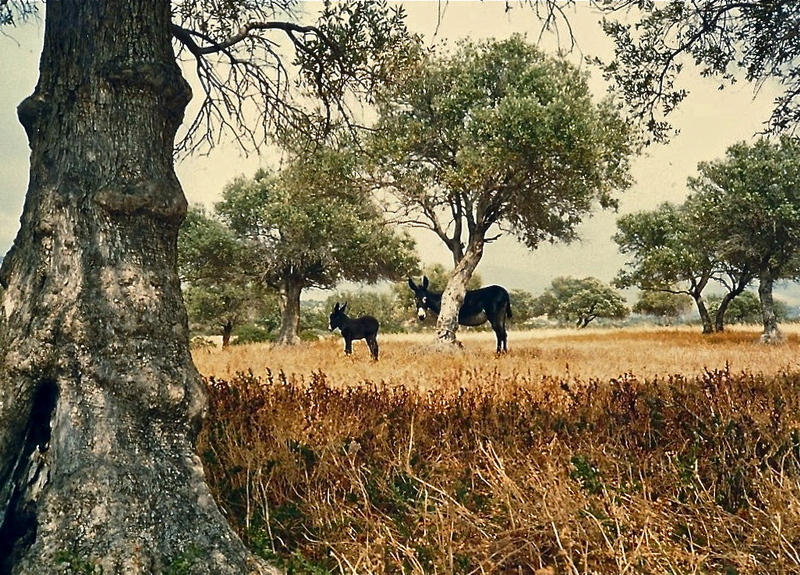 But as I gathered my thoughts by the side of the road I noticed a mother and baby donkey sticking close together, which made me forget my sorrows. Later I saw a lone bull tied to a post in a field, but still no signs of humanity. Donkeys. The baby stayed tight with the mother; the mother kept angling herself so that the tree was between her and me at all times. The moped still ran fine, so I continued on, albeit at a more judicious pace. Not much further up the road, I saw my first human of the afternoon. He was a casual looking guy in shorts, sandals, aviator glasses, and a t-shirt who spoke good English and explained that he was a tour guide from a nearby village who had to get up to the front for his military reserve duty. He wanted a ride. I showed him my raspberry and explained that I couldn’t vouch for my competency handling the moped with an extra person on board. He shrugged and said no problem. We rode together for another half hour or so, and I only lost control of the vehicle once before the reservist reached the point where he needed to get off. There was still some open road ahead, but he assured me I would reach the border closure imminently. I pressed forward anyway. A quick skinny-dip on the way back, giving my clothes a chance to air out. 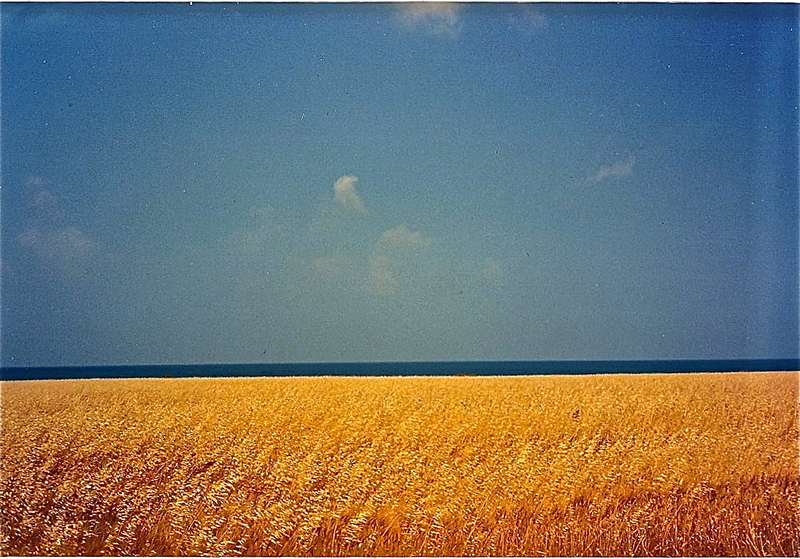 your photos taken by film with leaking light effect are awesome! I love them! Thank you! Sometimes the best art is unintentional.